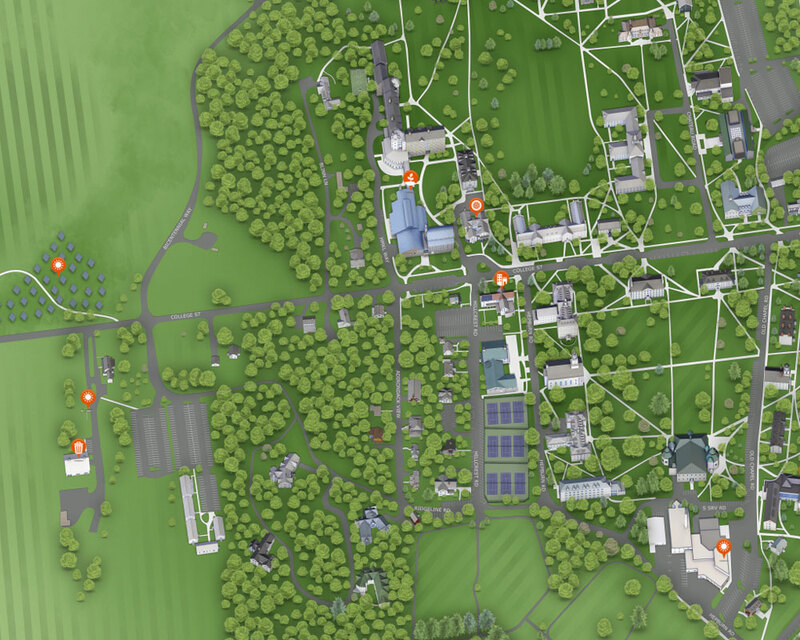 With the creation of solar farms and the installation of solar panels on campus, Middlebury is exploring additional ways to incorporate solar energy into everyday campus life. At the urging of students, Middlebury built a 143-kilowatt, 1.5-acre solar farm on Route 125, west of McCardell Bicentennial Hall. The 34 solar trackers on the farm are from AllEarth Renewables, a company based in Williston, Vermont. AllEarth manufactures the innovative solar energy systems, called AllSun Trackers, which feed electricity into nearby power lines. A research grade set of photo voltaic monitoring sensors and instruments was also installed to collect and store data for research by Middlebury faculty and students. The solar farm produces about 243,000 kilowatt-hours each year—more electricity than is used annually in Forest, a student residence hall. The solar panel energy production report shows monthly progress and reports. In 2015 Middlebury became the exclusive purchaser of electricity from nearby South Ridge Solar Farm. In combination with the campus solar farm, 5 percent of campus electricity is now solar generated. In 2016, Middlebury entered into a power-purchase agreement with Wilber Solar on a 500 kilowatt project, which will bring our supply of solar electricity on campus to about 8 percent of what we use annually. In 2011, Middlebury was the first undergraduate liberal arts college selected to compete in the U.S. Department of Energy’s Solar Decathlon, an international competition to design, build, and operate solar-powered houses that are cost effective, energy efficient, and aesthetically pleasing. That house, Self-Reliance, won first place in three of the ten categories. In 2013 Middlebury placed eighth overall with a design called InSite. Both homes now serve as undergraduate housing on campus. Solar panels have been installed on the Franklin Environmental Center, the Solar Decathlon’s Self-Reliance and InSite houses, and Farrell House. Together these produce about 259 kilowatt hours a year. In addition, two solar hot water systems have been installed in student housing.